I must admit that I truly do not like to read. However, I do know that it is a necessary evil in order to grow my knowledge. Since I have become a Realtor I have gained interest in reading books that help me to keep a positive attitude as well as increase my knowledge in real estate and business. The Go Giver is a book that meets both of these. The GO Giver tells a story of a man that wants to be successful so bad he is willing to think outside of the box to be so. His name is Joe he is what the book calls a true go getter. There are sometimes that Joe feels like the harder he pushes to become successful the further away the goal becomes. He is just like most of us in business. He begins to focus on a big sale, so much so that he starts to become desperate. He is approaching the end of a quarter that is a bad one. I love this book because it fits my life so well right now. People are constantly telling me to find a mentor. Someone who has been through it all and can give sound advice. Joe does this in the book with a man that is referred to by people as the Chairman. His name is Pinder and he is a legendary consultant. Pinder tells Joe “most people just laugh when they hear that the secret to success is giving… then again most people are nowhere near as successful as they wish they were.” Joe begins a process over the course of a week and Pinder introduces Joe to a handful of “GO Givers.” First is a hot dog stand owner turned restaurateur owning many restaurants as well as real estate. He continues the week meeting several others, a CEO, a financial adviser, a real estate broker and the “Connector” who is the one that brings them all together. Pindar had his friends teach Joe some great concepts. 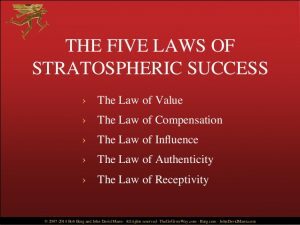 They are called the Five Laws of Stratospheric Success which help him learn the concept from above about giving. Joe learns that he has to stop focusing on the “getting” the big deal and start focusing on “giving” to others. Putting others interests before his own and adding value. This concept leads to results that Joe never thought possible. The Go Giver is a book about an old biblical proverb “give and you shall receive.” I can not tell you why this works. Some might even call it the act of God. All I can say is that this concept works. I have learned from this book that it is not only something that is tied to my real estate business or even business in general. I can be and should be applied to every aspect of life. I know that if I apply this to my marriage and I give one hundred percent love to my wife all the time and put her needs first, the likely hood that she will return the favor is much higher than if I wait for her to give to me first. When applying it to my real estate business, I honestly try and help each client I have, find a home that fits there needs. If I focus on the paycheck at the end then everything I do for my clients will come across as not being genuine. I am an on-purpose Realtor and love what I do. I have lived in the Snake River Valley for over 30 years. That experience makes me a specialist in my area. I can tell you about the history of our cities as well as the topography. Even the aquifer where we get a lot of our water from. I am your Snake River Valley Real Estate Specialist. I will work for you not so that I can get. But so, I can give you the information needed in deciding on a home in our area. I suggest you read this book. Learn to give. It will change your life as it did mine.